Are you tired of the same old same old? Are you ready to subtly jazz up your look without giving your parents a heart attack? Do you want to stunt on everybody you know for a decent price? Don’t stress, I’ve got you covered. Just like tattoos, piercings can tell a story about you—you just need to decide what the story says. Read on to find out all the styles you can get and what you should expect during and after each piercing. I know it sounds generic and like everyone has them, but getting your lobes pierced defines the best way to start your ear piercing journey. Especially if this marks your first time getting anything pierced. You have to start small or you might ruin the entire experience for yourself. But don’t think you should stop at just one. Upper or lower, you’ve got a couple of options. Lobe piercings sometimes have a bland reputation, so spice it up and get three piercings on one ear and two on the other. Jewelry exists so that you can express yourself, so utilize them. “I love how my ear piercing makes me feel and look; something so simple ended up doing a lot for me,” UF senior Ronald Levinson said. On the pain scale, I wouldn’t worry too much. The pain is minimal—one of the most manageable piercings you can get. Despite the slight sting during the initial piercing, the only thing that might bother you the first week or so involves sleeping. Get used to resting on your back for a bit since laying on your freshly pierced causes you unnecessary discomfort. The price will range depending on how many you get, but usually $10 to $20. Now that you mastered the lobe, let’s try to step up our ear piercing game. A little different than the usual lobe piercing, a straight or curved barbell pierces your lower earlobe horizontally. So instead of front to back , the piercer pierces from side to side. No two piercings will look alike depending on the size and shape of your ear, so don’t go to your piercers expecting to look like your friend. 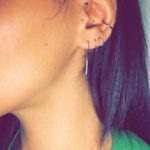 Since the majority of the piercing resides inside your ear, this hurts slightly more than the average lobe piercing and will take longer to heal—about two to ten months to heal and costs a little more at $50. Future piercee’s beware: the transverse lobe has a higher susceptibility to infection due to the positioning. Starting from the bottom and now we’re here, the auricle piercing sits on the outer rim halfway up your ear—right between the helix and the lobe. This piercing allows you to flaunt all your jewelry dreams, whether they are studs, barbells or those fancy rings you’ve been dying to try out. Unfortunately the area the auricle resides has nerve-endings in the cartilage, so expect some more pain than the usual piercing. But if you can handle the pain of this trendy style, then prepare yourself to reap the benefits of a definite fashion statement. Though the pain should go away in about two weeks, try not to change the piercing for at least three months—maybe nine just to stay on the side of caution. It should cost about $15 to $20. Now for these particular piercings, you have a couple of fun options because the helix itself makes up the upper part of cartilage. Not many nerve endings exist there, so don’t fear the very controllable pain. And why stop at one when you can get three, known as the triple helix, depending on how you want to look. Feeling feisty? Try out the forward helix, the delicate look you didn’t realize you were looking for. Much like the one mentioned before, the forward helix sits on your upper cartilage, but piercers place on the cartilage directly above your tragus. Place a stud there for a subtle chic look, or balls out and get all three placements pierced with rings to let out your inner wild child. Just prepare yourself for a long healing journey: you’ll have to wait six to eight months before you can change out your piercing. And ladies, careful with the long hair, you have no idea how much getting it snagged on your helix piercings can hurt your soul. These can range anywhere from $20 to $50 depending on where you go. Now’s the time to whip out our brave facades in order to get this bad boy done. Here were have two piercings in one: one on the upper cartilage (forward helix) and on towards the lower part of cartilage. The openings connect with a single straight piece of jewelry, horizontal on your ear. Since this seems like a two for one deal, prepare yourself for twice the amount of pain. I hate to break it to you, but this one might hurt more than the average piercing. You can also opt for the vertical style industrial bar, called the suicide industrial. Just like the name suggests, this piercing goes through your forward helixes and connects to the lower area on your earlobe. As scary it sounds, the overall look honesty makes you look wicked. Expect about eight months healing time and $40 to $70 price-wise. You know that little part of your ear that like kinda just hangs out in front of your ear canal? Why not get it pierced? Though common in nature, surprisingly not everyone can actually get this piercing. Ears come in different shapes and sizes so don’t get discouraged if you can’t get it pierced due to the smaller size. If that happens, you can always get the anti-tragus. Dress that ear up with a curved silver barbell or small black hoop. The pain won’t phase you and you’ll only feel sore for about a week. The price won’t hurt that much either: you should pay around $40 to $50 for one. Try not to change out the jewelry for up to four months. The time will fly by compared to other piercings. 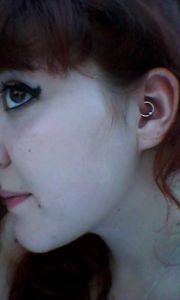 Oh daith piercing, how I love you so. Not only do you make people rock their look to the fullest, you can help control migraines. “The main reason I want my daith pierced is because I heard it could possibly help with my headaches. True or not I know it’s going to look cute,”UNF senior Nikolle Patrick said. Pierced on the innermost fold of cartilage in your ear, the daith can make you look a lot cooler than usual—I know. Awkward to actually pierce, do some research and find a place that has a reputable piercer. You really don’t want them to f–k up on this one. I won’t lie or sugar coat it for you: daiths feel more painful than other piercings—think six out of ten. But girl, once you get that piercing and go through the nine months of healing, know that your ear game leveled up. I’m talking queen B material. Overall its costs $40 to $50. Worth the price when you start stunting on everyone. Situated on the cartilage directly above the daith, the rook hurts just as bad if not a little more than the daith. That has some real thick cartilage. To help ease the six month healing process, get it pierced with a curved barbell. Still very cute but you won’t have to worry about it getting caught on anything. Rooks prove themselves as pretty unique statement pieces and add a little spice in your life. Best part: you won’t break the bank with having to pay about $35 to $50. Yup. This piercing is everything that comes to mind when you picture it. A freaking constellation on your ears. These clusters of piercings can sit on your earlobes or cartilage in any fashion you so choose. You can really express your creative side once the initial two to six months (depending on where you get it) of healing pass. Choose where the stars, comets and planets are on your ears and map out the solar system to tell everyone that the world literally revolves around you. You can have so much fun with this piercing and really look one of a kind. Depending on many you want and where you want the piercing, the price varies from $20 to $60. A little different but extremely simple, the flat piercing lays on the flat part of your upper cartilage. The pain should be the same of any cartilage piercing, and a lot less painful than the daith or rook. Though you won’t get to wear rings for this one, you can find cute flower studs or small golden hearts to add that extra touch your ears needed. Healing lasts around six to eight months and costs from $20 to $50. NEVER think that you should just pierce your ears yourself. Trust me. It might end up as more cost efficient but chances are that the placement looks off, this comes from personal experience, and you increase the risk of getting an infections. Also, avoid a piercing gun at all costs. Though fast and easy, they have a reputation of shattering cartilage, causing blunt-force trauma and can cause the spread of germs and disease if not cleaned properly. Piercing guns use jewelry that have the same standard length for an earlobe, but what happens when your ear is thicker than the standard? Well, your healing process might feel unpleasant without the relief of a longer stud. I shouldn’t have to say this, but just in case, clean your piercing at least twice a day with a saline solution or the aftercare piercing shops should provide. Side note: actually listen to what the piercer tells you to do too—believe it or not they know the things they talk about. And please go to an actual piercing place or tattoo shop instead of Walmart or Claire‘s. Just because you can save a couple of bucks getting your ears pierced doesn’t mean you should. Often times a lower price tag comes with an increased concern for infection. And don’t feel pressured to get one like your friends because it happens to like like the latest trend. “I’ve been a piercer for over 20 years and still haven’t seen anything new compared to what people think is the hottest thing now. It’s not different, it just becomes popular again and people call it a different name,” Bodytech Tattooing & Piercing piercer and manager Justin Berk said. Just get it done right the first time and you won’t have to worry about it in the future. Try to check with you workplace too, to make sure you can actually wear your new piercing: nothing good can happen from having to constantly take your jewelry in and out. Don’t forget to do your own research either; good thing you started here.